Be covered properly for your next holiday when living with bowel cancer. Find out more about our travel insurance below. When you’re ready, get your quote online or talk to us today. In the UK alone, every fifteen 15 minutes someone is diagnosed with bowel cancer. That’s almost 42,000 people per year. * We see it that living with any medical condition, including bowel cancer (otherwise known as colon or rectal cancer), should never interfere with the enjoyment of your holiday. We consider all pre-existing medical conditions as part of our travel insurance, and bowel cancer is no exception. Where we can’t offer you a suitable policy, we can suggest alternatives that may be able to offer you cover for your bowel cancer. Find out more about how we can insure you when you’re living with bowel cancer, or in remission below. When you’re ready, you can either get your holiday insurance online or call us today on 0800 033 4902. Why do I need travel insurance for bowel cancer? When going on holiday, the last thing you want is something to go wrong. Particularly at that time you’re meant to feel carefree. We can’t promise nothing will go wrong when you’re away, but we’re here to help pick up the pieces if it does. Things going wrong when you’re away can happen more often than you may have realised. In 2017, 1 in 20 people claimed on their travel insurance. *** So, we like to think travel insurance is the key to any happy holiday. Is it really worth risking otherwise? Problems can arise when we least expect them, from flight delays, lost luggage, a stolen passport or a medical emergency. We’re here to give you the reassurance that if the worst happens, you’re covered properly. The right travel insurance can save you the worry and costs that occur from the unexpected. Surely, peace of mind is priceless? For us to be able to offer you cover, we’ll need to assess your medical history with our medical screening process. The medical screening is not a long-winded exam, but instead a straightforward set of multiple choice questions, designed for us to understand how your condition(s) affect you. Please make sure the answers you give us are as accurate and thorough as possible. Failure to disclose all pre-existing medical conditions that you have will affect the validity of your policy in the event of a claim further down the line. What questions will I be asked about bowel cancer in the medical screening? Has there ever been a spread from the bowel to other parts of the body? Were you advised to have chemotherapy as part of your treatment? Is there any further cancer treatment planned? What does our travel insurance cover for bowel cancer? I have received a terminal diagnosis, can you still cover me? However, we can signpost you to the British Insurance Brokers Association (BIBA) to assist you in finding appropriate cover. We can also suggest InsureCancer.com who can also be contacted on 0845 6490190. Insure Cancer specialise in providing cover for people with active, metastatic, relapsed or terminal cancer, as well as those involved in clinical trials. I am awaiting surgery/further treatment for my bowel cancer. Can you offer me cover? Where you’re awaiting chemotherapy, radiotherapy or surgery for your bowel cancer, we may still be able to offer you some level of cover. 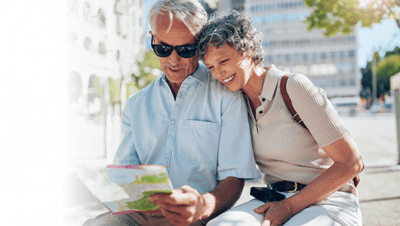 It’s important to recognise that we would have to exclude all your pre-existing conditions including bowel cancer from your travel insurance if you’re awaiting any of these types of treatment. We would, however, still be able to cover you for any claims that are unrelated to your disclosed pre-existing medical conditions, as well as cover for things like lost baggage, delays or other unforeseen circumstances. But if you had a medical emergency related to your bowel cancer, we would not be able to cover you. **Awarded by Moneywise in 2017 and 2018.